Liberatore worked three innings, striking out five, winning MVP honors. Liberatore came back out to start the tenth inning, for his third inning of work and continued where he left off, mowing down hitters. With one out, Kevin Vargas made solid contact and singled, but Liberatore followed that with another strike out and a fly out to left. With that, we moved to the bottom of the tenth still tied at 1. In the bottom of the tenth, Mike Siani came in to pitch for the National team after playing outfield earlier in the game. Getting a chance to show himself as a two-way player, Siani got Alexander to fly out, struck out Chicago native, Alek Thomas, and Will Banfield on a fly out. Liberatore worked his third inning on the mound in the top of the 11th, which resulted in a fly out, strike out, and another fly out. Liberatore was impressive, and stood out with his dominance. In the bottom of the 11th, Siani came back out to throw and gave up a leadoff walk. Kelenic, who got the leadoff walk, stole second base and then advanced to third base on a wild pitch. The wild pitch came on ball four to Gorman, who then took second base on defensive indifference. With second and third and none out, Adams singled to center field to push across the winning run for the American team, defeating the National team by a score of 2-1, giving the 10th annual event extra meaning as the first to feature both an extra inning game and walk-off hit in Under Armour All-America Game history. Kameron Ojeda with the Gatorade G award. Matthew Liberatore with his three innings pitched and five strikeouts, takes home MVP honors for the game. Kameron Ojeda takes home the Gatorade “G” award for hustle for the game. Ray Delgado was named the Kelly Kulina Award winner, given to the player who demonstrates the best attitude, work ethic, dedication and enthusiasm. Ray Delgado named Kelly Kulina award winner for best attitude, work ethic, dedication and enthusiasm. Chandler Champlain came in to pitch in the bottom half of the inning, getting a quick ground ball to second base that Delgado made a great play on in the hole. Cabell, with one away, ripped an opposite field double giving Alexander a chance with a man in scoring position. Blaze was then hit by a pitch on his hand, setting up first and second with one out. Ben Harris then went down looking on a good breaking ball for the second out. Cabell then tried to get an early jump on a steal attempt and was thrown out at third to end the inning. At the end of seven innings in Chicago, the American team still held a 1-0 lead over the National team. In the top of the eighth inning, Garrett Wade came in to pitch for the American team. He recorded a quick out, and then an error in right field resulted in a man on third with one out. Casas, a two-time Under Armour All-American, ripped an RBI double to left center field to tie up the game for the National team at 1-1. With Casas being the potential go-ahead run now in scoring position at second with one out, he was left stranded after a ground ball out advanced him to third base, and a fly ball to center ended the threat. With the score even at 1, we moved to the bottom of the eighth. J.T. Ginn took over on the mound, and first to face him was Ojeda who topped a ground ball back to the mound that Ginn made a nice play on to record the out a first, followed by Kelenic hitting another ground ball back at him that he made the play on. With two out, Home Run Derby Champ, Nolan Gorman singled to center and then advanced to second on a passed ball, but Adams struck out to end the inning. Through eight innings, still tied 1-1. Matthew Liberatore was next to throw, and struck out Rece Hinds on three pitches to start the top of the ninth. Liberatore was dominant in his first inning of work, following up the strikeout with a fly out and another K.
Ginn came back out to pitch in the bottom half of the ninth inning, getting two soft line outs to second base and a broken bat fly ball to center. Nine innings was not enough to decide this one, as fans were treated to free baseball at Wrigley Field as the score remained tied at 1-1. In the top of the fourth inning, Luke Bartnicki took the mound for the American team and kept with the trend of the game, pitching a quick and scoreless inning. For the bottom half of the fourth, Brandon Neeck allowed a baserunner, but it was quickly erased by a caught stealing. The American team was then able to work a walk and an infield single and with two outs and two on, Kody Milton was given the chance to break open the scoring but struck out swinging to end the threat. In the top of the fifth, on only five pitches, two outs were recorded by David Luethje. Luethje then recorded a strikeout for the third out, still scoreless into the bottom half of the 5th. Braxton Ashcraft, a Baylor commit, came out to pitch in the bottom of the fifth and recorded a three pitch strikeout to the first batter. The trend of deep counts continued, as Elijah Cabell was quickly down 1-2, and went down swinging. The next batter – Blaze Alexander – ripped a ball back through the middle that hit Ashcraft on the mound, and was deflected to the second baseman who made a barehand play to throw him out. Another 1-2-3 inning. In the top of the sixth, Cole Winn took over on the mound, and Kevin Vargas quickly greeted him with an opposite field line drive single. Vargas was moved to second on an out, and moved to third on a ball in the dirt. With a man on third and one out, Winn struck out Triston Casas looking on a nasty breaking ball. With two outs, Noah Naylor worked Winn to a 3-2 count, but grounded out to end the threat. Jaden Hill, the LSU commit for both baseball and football, comes in to pitch in the bottom half of the sixth. Hill gave up a leadoff walk to Ben Harris, who then stole second. Kameron Ojeda then worked Hill to a 3-2 count, but a nasty change up gets Ojeda to tap the ball weakly back to the mound, and no advancement of Harris. The next batter Jarred Kelenic punched a ground ball single to the opposite field through the left side to set up runners on first and third. Jordyn Adams was next to hit, and on a 3-2 count, Hill threw a wild pitch to the backstop, walking Adams and scoring Harris to give the American team a 1-0 lead. Hill then struck out Witt Jr. to end the inning. The 2017 Under Armour All-America Game is underway at Wrigley Field. The American Team (red jerseys, first base dugout) is the home team against the National Team (blue jerseys, 3rd base dugout). Ethan Hankins started on the mound for the American Team, pitching a scoreless first inning. Kumar Rocker started on the mound for the National Team, also putting up a scoreless first inning. Mason Denaburg entered the game for the American Team in the second inning. Denaburg pitches out of a bases loaded jam to keep the game scoreless through an inning and a half. In the bottom half of the inning, the new pitcher for the National Team, Ryan Weathers, was also able to pitch out of some trouble, producing a 5-4-3 double play to end the inning. 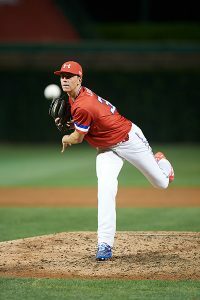 In the top of the third inning, Ben Harris was on to throw for the American team, and other then a deep fly ball, kept things in tact and still scoreless through two and a half frames. Cole Wilcox came on to hurl for the National Team in the bottom of the inning, producing another quick inning and tallying a strikeout.